On the 31st of August and the 1st of September, starting from 20:00 till the end of the next day trams will not run near the Zabłocie-Krzemionki construction project. Here are your route changes if you are traveling through that area. Traveling from Krowozda Górki or Bronowice Małe? (trams 2 and 24) You can travel to the “Starowislna” stop no problem. 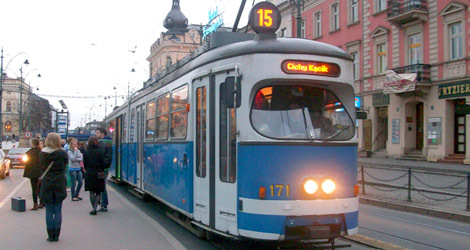 After that the trams travel with a new route through Dietla – Grzegórzecka – Kotlarska – Herlinga-Grudzińskiego – Klimeckiego – Kuklińskiego – Saska – Wielicka and then as normal starting from “Kabel”. Traveling from Salwator or Bronowice? (trams 6 and 13) The same applies starting from “Stradom”. Same applies with travelers from Czerwone Maki (trams 11 and 23) who travel normally till “Limanowskiego”, then the trams continue as normal from “Lipska”. Commuters in Nowa Huta have had the drive from one part of the neighborhood to the other simplified with the creation of a tunnel between Ruszcza and Wadow (different parts of Nowa Huta). For the longest time this tunnel was not on any bus path, making the journey twice as long. ZIKiT is now looking for contractors to install the proper lighting needed for public transport vehicles to use the tunnel. Currently, the 110 bus ends its journey right before the tunnel, forcing commuters to jump on a less frequent connecting bus. ZIKiT officials say that once the proper lighting fixtures are settled, the 110 will drive through the tunnel to the Wadow part of Nowa Huta.